so cute! please enter me in your drawing and drop by my blog too if you haven't. #955 on the magic carpet! Oh, how kerspif! And just as I'm getting acquainted with my first MP3 player, too-- it would be perfect! Glad you joined the Ride! I invite you to hop over to my blog to enter OWOH giveway! Yes, yes, please enter me in your contest for the MP3 player case - love the colors, the texture, the style! New to OWOH, I'm going on the tour and hope to post it on my blog next year, too. But stop by anyway and say hi....if you have time!!!! You said it all in your post! I have made so many great friends in Blogland...so great in fact that a couple of years ago...12 of us got together ! One of them being Lisa Swifka! She is a super talented , sweet, woman! Anyhoo..love your ipod cover! Perfect...please come see me too! We just bought my little sister an Ipod for her birthday and boy could she use this! Please come and join my magic carpet ride too! I like this little bag. I would like to win it even if I don't have any fancy gadget to use it for. I'm sure I can find some use for it!! Hi EV, what a lovely idea and post you have. I love the needle felted case. I'd love to win. I absolutely love your gifts. Please take time to visit my blog, too, for a chance to win my book, 16 x MOM: A Mastery of Motherhood. I'm working on getting all the country flags. I promise to revisit your's too. 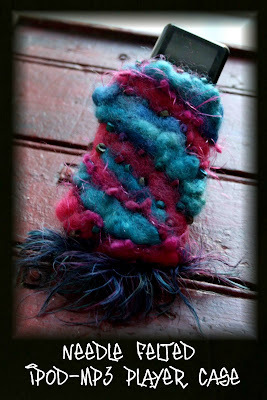 Everyone needs a cute felted case for their cell phone, me included! Please enter me. My iPod or cell phone would love to be wrapped in that creation! Thank you so much for your giveaway! What a lovely gift! Please include me in your drawing. My listing is spot #1028 in the giveaway - Please visit! Oh what a fun giveaway. My IPOD so does need a bed :) Stop over for a visit if you get a chance. Nice to meet you! Too fun! I love the funky colors. Pop over to #743, if you get a chance! Happy Magic Carpet riding! Yes please, You are so talented! I've spent hours looking at your website I just love your dolls--do you still teach classes? How often do you have dolls for sale? All the wonderful giveaways...I have always believed that any gift made or given from the heart to another is giving a piece of yourself. I would be honored if you would enter my name. Please stop by my place, Southern Ooaks #760, on your next ride. Have some Sweet Iced tea...look around and then enter for one of my gifts from the heart. i just got an Ipod for Christmas, so this would be perfect to win! Thanks for stopping by and what a lovely giveaway! Love it EV! Have been doing some needlefelting myself! Very nice! Would love to be included! Hello from the north of 60! I hope you are enjoying the ride on magical carpet as much as I do. Please enter my name for the draw. Such a lovely iPod cover! I would love a chance to win! I really like the combination of colours in the felted case! Ooo cool! A case for my phone! Or mp3! Score! Thank you for a lovely stop on the magic carpet! What a fantastic giveaway! Please add me to your drawing and thank you for your generosity. Hi, I really love the colours, thanks for the chance to win. Fly over to my blog and enter mine. Gorgeous and unique! Love it! Thanks for the chance to win. I love your little iPod case, please enter me in the draw. Please come by #70 and enter into my draw, great to meet you. What an awesome giveaway; please count me in ! The little felt case is so cute. I will certainly find something to put in there in case I were the lucky winner. Please count me in your wonderful giveaway draw and come and visit my blog too and enter my giveaway as well! from very snowy countryside of Sweden! We didn´t have this much snow on over hundred years! Awww this is too cool! Please enter me into your fantastic drawing! Please add my name to your OWOH giveaway list, and do take a moment to stop by my blog and enter my OWOH give - Nice meeting you! My ipod needs one of your covers :) Please enter my name into your giveaway -- thank you!! What a great giveaway and I love the colors. Would love to be entered in your draw. great giveaway. Please add my name to your draw. HI Ev! Another AHA-er signing up for your great giveaway! Love that some of us are participating. Pick me! I think you already stopped by -- I have so many comments to read! Another felter, great and thank you. Please visit my blog #840 to see the felt flower brooch I am giving. Thank you for letting me enter. Great giveaway! Count me in! There are so many talented people on this Magic Carpet Ride; it's been fun visiting and being so inspired. If you can, pop on over to #395; that's me! Lovely case, please count me in. When you get some free time fly on by my blog on your magic carpet, I am OWOH #907. I have heard of this and think it's a great idea. Nice blog! What a colorful little bag. I love it! You did a great job making it. I must go check out more of your blog and your other blog, too. I, too, love to make new friends. I hope you are enjoying this event. hanks for participating in the OWOH event. Your case is so cute! Thanks for offering it. your ipod case is beautiful! I love your ipod felted case! Perfect color too! Please count me in as I would be thrilled to win it! fun giveaway! thanks so much for the opportunity to enter your drawing. this is such a fun way to meet other folks. I hope you'll stop by my blog and enter my giveaway as well. So nice to meet you. And who couldn't use such a pretty little ipod cover as that! What a great way to connect artists and people in general.I've been to some of the blogs and they're really great! Oh wow... what beautiful needle felted case! What a great blog you have too! Please enter my name into your fabulous drawing for a chance to win. How absolutely adorable. I love the MP3 player case. It is so practical and beautiful. I love it when art and function collide. 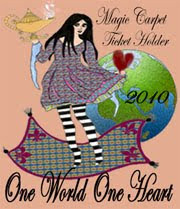 My giveaway is #79 on the OWOH magic carpet ride. Please stop by and sign up. Sweet gift you are giving (I could use your beautiful little case for my phone! ), I'd love to enter! If you haven't already, feel free to stop by my blog #135 and enter to win 1 of 3 give-aways! Nice meeting you...sending love and blessings from New Zealand! Pretty ipod holder! Thanks for sharing! What a wonderful gift my ipod is in desperate need of a case. I will be back to have a proper look at your blog at my leisure. Love the case ! So cute and cozy ! Thanks for the chance to win. I hope you are enjoying the OWOH adventure ! Great giveaway...my ipod would look great in that!! how cool is that? I would like it for my naked ipod. Great! Thanks! Please come to my blog and participate in mine #626. Beautiful! Thanks for the entry. I'm #836 http://evolutionofagardener.wordpress.com/ . What a unique giveaway! This would work wonderfully in my car...as much as I am in there with the kiddos, I'd love to have something beautiful to hold my lifeline a.k.a. music a.k.a. Ipod! Thank you for entering my giveaway as well at http://lifeunity.blogspot.com. Perhaps someday I'll get into working with fabrics and yarns - it is amazing what you can do with them! Please add my name to your generous giveaway and have fun checking out all the creative blogs on this magic carpet ride. I have an Ipod ;-) and I'd love to win your lovely creation :-) So please include me in your drawing! Kamusta" from the Philippines! I would be thrilled to win your prize-so interesting and unique! and if you haven't already, do drop by my blogs too! Hi Ev...I love your OOAK dolls! Fabulous! Please count me in on your giveaway for OWOH. Your dolls are amazing and so is your blog. We would be SO excited to win! Thanks for having us over to visit. If you haven't already popped by my blog, eat write create, please fly over on this magic carpet and enter my giveaway for some of my photographic art cards. I love your knitted case! Really cool. Please enter me! Thank you so much for visiting my blog. Please include me in your lovely giveaway, the colors and texture is just beautiful. So pretty Ev. Please count me in on your drawing. Have a wonderful evening and a Happy Valentine's Day.